Rosie having a swimming lesson. This is Rosie, enjoying??? a swimming lesson in HULL. She has to have a regular swim to ease her stiff rear legs,due to the Cushings Syndrome she inherited from her mother. Her legs are getting worse,as she now drags her legs,rather than 'piston pumps' as she used to,about a year ago. She is still 'up for it'though. Comments for Rosie having a swimming lesson. Looks like you wore her out!! 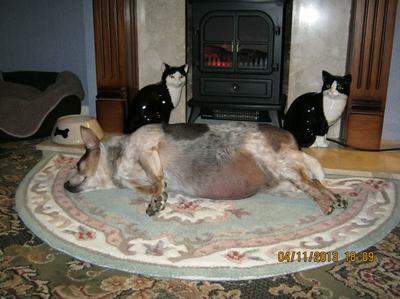 Love how she is lounging by the warmth and how the two "cats" are watching over her.